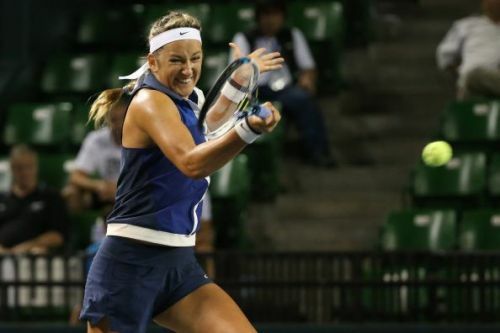 Victoria Azarenka had to play some heavy amount of tennis to advance forward at the Toray Pan Pacific Open on Tuesday night. The 29-year-old got into tight challenges against Kurumi Nara of Japan but held her in straight sets 6-4, 7-5 on the main court at Arena Tachikawa Tachihi. The two-time semifinalist of the tournament returned after a four-year absence to compete with all she had to get back to those moments. She met Nara for the first time in WTA competition with a lot of support behind her. With the recent Grand Slam win of her fellow countrywoman, the inspiration to defeat a former world number one would be on the mind of the 26-year-old to pull off a major win of her own. She nearly had a break to love on the Japanese star but watched her come back to force deuce and take the game back into control. She couldn’t pull off the actions of the Belorussian and watched her break chance to slip into a one-all tie. She held her end again in the third as Azarenka forced deuce but not the win. The 29-year-old got even on the scoreboard before breaking away against Nara’s serve in the fifth. It took a lot of effort but produced good results. She added a hold that gave her a 4-2 lead before earning a double break in the seventh to serve for a shot at the set. Getting it done against Nara proved difficult as the Japanese star forced her way to deuce where she got it done on the second break. She added a second game making it a one-game buffer for the Belorussian who wanted the set over and done with. She got her wish in the tenth where she saved a break point chance for the 26-year-old to watch the set come to a close after 44 minutes. Azarenka kept the pressure on Nara who tried to keep herself together to start the second set. She saved a number of breakpoints on deuce showing plenty of fight but not enough to stop the former world number one from getting the win. Nara answered with a break back before consolidating that in the third with a service hold. She picked up her first double break of the match for a 3-1 lead before suffering a break back from Azarenka who began her fight back. She added a hold in the sixth that evened the score at three-all before it became a race to the finish. Nara led the way for a moment but a break after holding in the eighth gave the Belorussian a chance to end the match on her terms. She started by getting behind on serve with a failed challenge opening the window for Nara. Azarenka got on the board but had two break points to save. She delivered a crosscourt winner to cut it down to one and a line drive to force deuce. An unforced error from the 26-year-old brought up match point but was answered in the shape of a line drive winner that kept her alive. She had an AD point in hand on Azarenka’s double fault but made a critical error on the return that put them back to deuce for the third time. Nara got it back a second time for her fourth break attempt where she put it away with a well-placed cross court shot that levelled the score at five all. Gaining control in the 11th was a big moment for the two players as it meant the end for one a possible second chance for the other. Nara and Azarenka went to deuce where it stretched out to five long breaks where the Belorussian gained more chances to get it done. She did so to set up another chance to end the match her way in the 12th where she fought every point to defend her position and get the win on her fourth match point attempt that ended the night for her in 1 hour and 52 minutes. “I felt like I had a lot of opportunities to close the match earlier but Kurumi’s a great fighter, she fought hard and made a lot of balls in brought a lot of balls back but a win is a win,” Azarenka said during her on-court interview. She will try and get another facing Australia’s Ashleigh Barty in the second round Thursday.